If you want to avoid that toe-stubbing little step which exists at the entrance of many bathrooms, ask your builder to drop the floor by about 5cm before the sand cement bed and tiles are laid. That will ensure the finished floor height of your newly renovated bathroom is flush with the floor on the other side. This is especially relevant in ensuites where a carpeted bedroom might transition straight into the tiles, like in Lana’s Forever Home. Remember, “flush is fab” but if you decide it’s too hard and costly to drop the floor, that’s ok too, just beware of stubbed toes #ouch. In contrast to the Justice League movies, there can only be one hero in our bathroom stories whether it be a large black bath or turquoise feature wall. To allow these statement pieces to shine it’s important to keep everything else quite muted and subtle. A skylight located above the hero also helps put it in the spotlight. 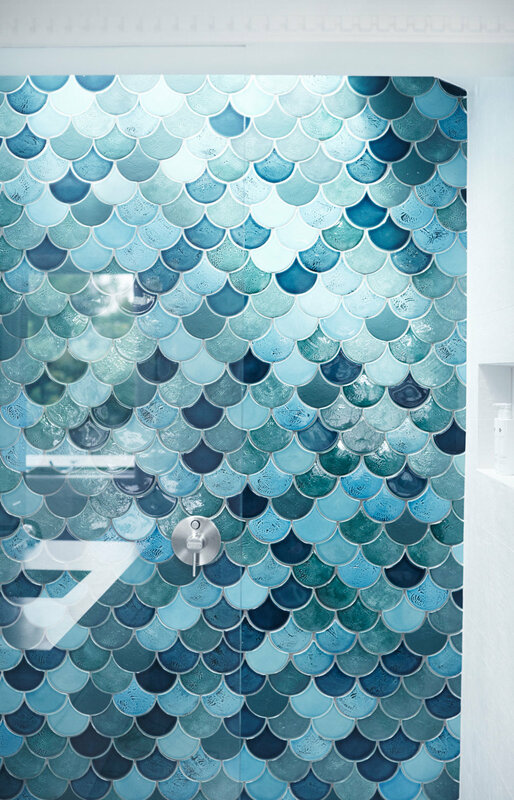 Make sure you spend time choosing your grout colour – it can make or break your bathroom. If you want your tiles to ‘pop’ as individual pieces choose a contrasting grout colour, but if you want the tiles to blend together and look like one big piece, choose a colour which matches the tiles. In Lana’s Forever Home, we chose dark grey grout for the feature wall so that the grout was less noticeable. We wanted the turquoise tiles to shine. Hot Tip: set up a few of your tiles on the ground and rub dry grout powder into the cracks to see what the end result will look like. 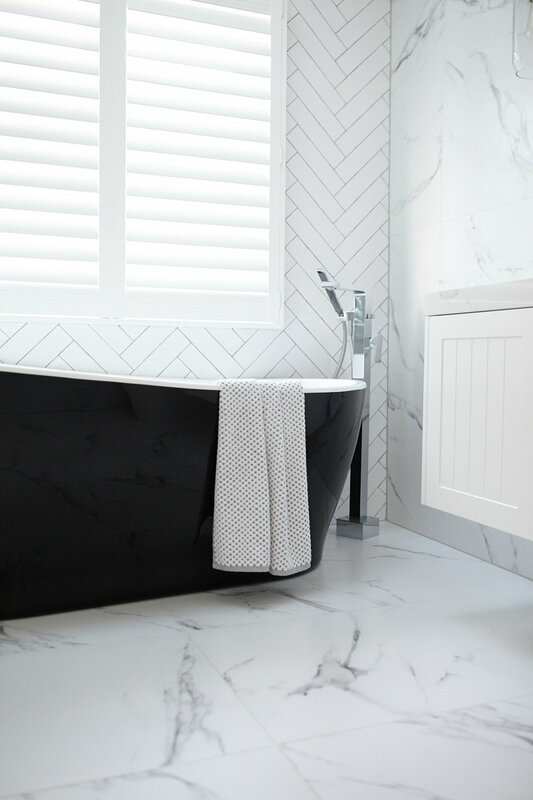 White plantation shutters are a fave for many and we love putting them in our bathrooms for a super-chillax Sunday sessions vibe. They’re easy to adjust for light and privacy and the Luxaflex Polysatin ones are mould resistant so perfect for steamy rooms with lots of moisture. Natural light is highly coveted in most homes, especially in bathrooms. Windows are one solution but skylights are hard to go past for added wow-factor. 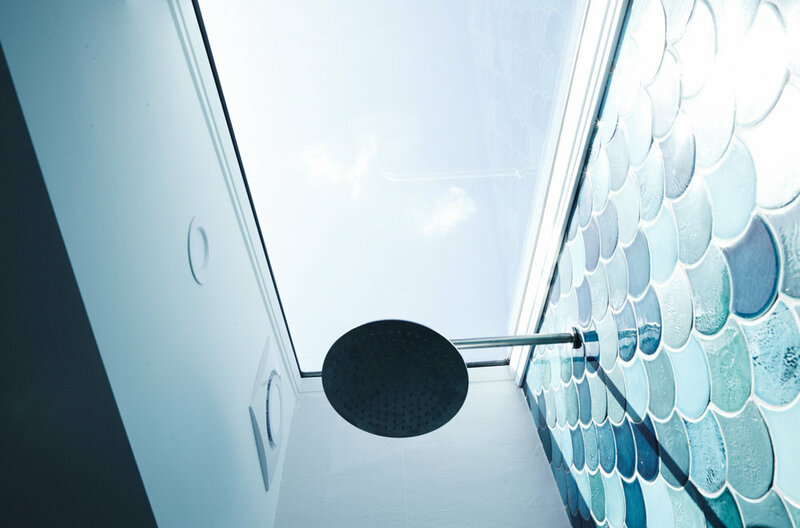 Try and position your skylight above the shower or bath where you spend most of your ‘relaxing time’ #heaven.